A scene from the Voices of the Winds People pageant to be Friday and Saturday evenings, Sept. 19-20, in Council Grove includes signing the 1825 Council Oak Treaty between government officials and the Kaw Nation. 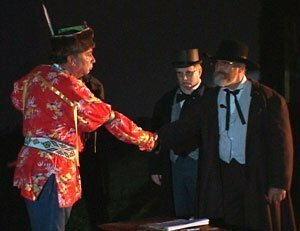 Although the Kaw Tribe was exiled from Kansas 141 years ago, members of the Kaw Nation will return once again to their Kansas homeland to tell the story of their ancestors for the outdoor drama pageant 8 p.m. Friday and Saturday, Sept. 19-20, in the Old Riverbed Amphitheater, at Council Grove. “Called ‘Voices of the Wind People,’ this will be a multi-media presentation depicting a series of live action scenes with both Council Grove citizens and Kaw Indians,” according to Sharon Haun, pageant chairperson. Historical artwork, photographs and paintings along with video segments are to be projected onto a large screen incorporated with early day Council Grove and Kaw village sets to bring life on the Santa Fe Trail along the Neosho River in the Flint Hills alive again. There will be real-life horse drawn wagons, a stagecoach and horseback riders accompanied by live singing, dancing, drumming, fiddling, bagpipe playing and mandolin music. “The pageant features an 1821 Santa Fe Trail horse-drawn pack train, wagon caravans, signing of the 1825 Council Oak Treaty, trading at the Seth Hays store, an 1859 confrontation between Kaw warriors and whites, raiding bushwhackers in 1863, and forced removal of the Kaw tribe from Kansas,” Haun said. Production of “Voices of the Wind People” is accomplished completely by volunteer staff and performers. Action is alternately narrated by the Kaw Chief Allegawaho and Council Grove trader Seth Hays. Allegawaho’s narration is rendered by Luther Pepper, great-grandson of Allegawaho, while Hays is portrayed by Mark Brooks, of Council Grove. “Thirty-five Kanza Indians of the Kaw Nation, whose ancestors once lived in the Council Grove area, are expected to return to participate in this production. Council Grove area residents perform a variety of roles as early townspeople,” according to Haun. Ron Parks wrote the pageant script in 1992, while he served as site administrator of the Kaw Mission State Historic Site in Council Grove. “Wind People” is the English meaning of the tribe’s name. “The script was subject to review by the Kaw Nation executive council and all subsequent changes have required the approval of the council,” Haun clarified. Now a National Historic Trail, the auto tour route generally follows U.S. Highway 56. “With more than 24 historical sites, Council Grove remains a treasure trove of history,” Haun pointed out. Remains of the Kaw Reservation, south of Council Grove, are still in place as is the historical Kaw Mission, where whites attempted to provide school for the Kaw tribe members who lived on the reservation in the early 1800s. This is the 22nd anniversary of the pageant, with the first production 22 years ago, followed by presentations in alternating years, this being the 11th production, the last in 2012. Sponsors are the Kaw Nation of Oklahoma, Kaw Mission State Historic Site, and the pageant committee of the Friends of Kaw Heritage. More information is at www.voicesofthewindpeople.com, or by e-mail to [email protected].